The community is invited to celebrate the completion of the Lee’s Summit Animal Control solar panel installation at 10 a.m. on Wednesday, July 11, at the Animal Control Facility, 1991 SE Hamblen Rd., Lee’s Summit, Mo. This project began as an idea from Lee’s Summit High School student, Zach Burton, who in 2016 was trying to think of a way to promote green energy in Lee’s Summit. After approaching City leaders and meeting with them over the course of two years, the project has become a reality. “I’m very passionate about protecting our climate, especially since climate change is a huge issue and solar panels are a good way to stop using coal energy,” Burton said. A 30 kilowatt system with 96 solar panels was installed to generate electricity for the animals, employees and visitors to the location. City leaders say energy from the sun will help power the whole building. Over the course of 25 years, the project will save the city about $136,128 in energy costs. 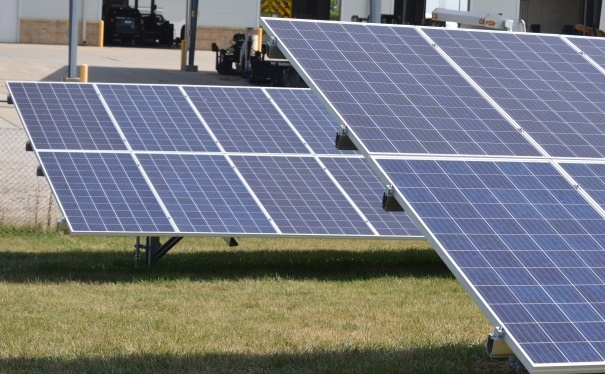 “We are looking at this as a pilot project and will be exploring additional opportunities to implement renewable energy within our municipal buildings,” Assistant City Manager, Mark Dunning said. The City of Lee's Summit received national recognition with a SolSmart Gold designation for the steps it has taken to make it faster, easier, and more affordable for homes and businesses to go solar. The installment of the solar panels reinforces the designation and advances the City’s commitment to renewable energy development. Every year, Animal Control rescues and provides temporary shelter to more than 4,000 stray, unwanted, abandoned, orphaned, and injured animals and has a 98% adoption rate.